VALDOSTA, Ga. (March 11, 2017) – The legendary South Georgia Motorsports Park eighth-mile played host to the record-breaking doorslammers of the Professional Drag Racers Association (PDRA) this weekend, with Florida’s Tommy D’Aprile scoring the PDRA Southern Extreme Nationals event win in Pro Extreme. Also earning pro class wins Saturday night were Jay Cox in Pro Nitrous, Jose Gonzales in Pro Boost, John Montecalvo in Extreme Pro Stock, and Eric McKinney in Pro Extreme Motorcycle. The sportsman class winners at the PDRA’s 2017 season opener were Tom Vanbeek in Top Sportsman, Mario Boesch in Top Dragster, Sadie Wicks in Pro Junior Dragster, and Tripp McCarty in Top Junior Dragster. Georgia racer Ken Grant scored the Bracket Bash victory. Veteran Pro Extreme wheelman Tommy D’Aprile notched the first win on his 2017 scorecard when he drove the Mel Bush Motorsports 2015 Corvette to a decisive win over Jose Gonzales in the final round. D’Aprile entered eliminations as the number-two qualifier with a 3.551 et. A 3.54 at 215.55 mph followed in the first round over Danny Lowry, who was unable to make the run. A timelier bye run in the second round allowed D’Aprile to move on to the semis despite slowing to a 3.811. D’Aprile dipped back into the mid-3.5s with a 3.562 at 209.01 to defeat Californian Jay Dietrich, though the screw-blown Hemi was wounded in the process. The Al Billes-led team rushed into action repairing the power plant during the short turnaround time before the final. With opponent Jose Gonzales patiently waiting, D’Aprile and team were able to return to the line to run 3.586 at 212.73 mph to defeat the 3.657-second effort by Gonzales. Gonzales, who drove the El General/Q80 Racing 2016 Corvette to a world-record 5.406 quarter mile et earlier in the weekend, certainly earned his way into the final. The twin-turbocharged entry improved from a 3.601 at 222.25 to a 3.575 at 219.01 in the first two rounds, then Gonzales scored a sizable holeshot win over Swedish FIA Pro Mod champion Mattias Wulcan in the semifinals. Even with such a proven competitor in the other lane, D’Aprile stayed focused on the task at hand to take the win back home to Port Charlotte, Florida. “With all due respect, I never care who I’m racing because I’m my own guy – I cut my tree, drive my lane and do what I need to do. I never worry about who’s in the other lane. I’ve got confidence in what we’ve got in the race car and who we have putting it together – Al Billes and all the guys on this Mel Bush Motorsports team. I really owe it all to them, as well as Mel and Johanne Bush for giving me the opportunity to run their race car,” D’Aprile added gratefully. Switzer Dynamics Pro Nitrous presented by MoTeC star Jay Cox, winner of three of the nine PDRA races in 2016, kicked off the new season with possibly his most successful weekend performance yet. The former Minor League Baseball player used two elusive 3.6-second passes to secure the PDRA Southern Extreme Nationals low qualifier award and event win. Cox drove his fan-favorite “Pumpkin” ’69 Camaro to a 3.679 at 200.71 mph – just two thousandths away from the et record – to claim the number one spot in qualifying. The Buck-powered entry stayed in the 3.7s for round wins over Lee Adkins, Jim Laurita, and Danny Perry. With final-round opponent Lizzy Musi having recorded a pair of 3.68s at well over 200 mph in the prior two rounds, Cox knew he would need a little extra motivation. He delivered a 3.697 at 199.91 to take down Musi and her 3.719 at 204.08 after the two Pro Nitrous hotshots engaged in a lengthy staging duel. The season-opening win has special meaning for Cox, who was sent looking for a new major sponsor over the winter. He found one in Garysburg, North Carolina-based Clements Mechanical, a mechanical engineering firm new to the sport. While Jose Gonzales made headlines this weekend for his record-shattering quarter-mile run in the El General/Q80 Racing Pro Extreme car, his performance in Andy McCoy Race Cars Pro Boost was also impressive. Gonzales recorded a weekend-best 3.684 at 214.66 mph to qualify number one, then laid down back-to-back 3.688s to dispatch the supercharged entries of Larry Higginbotham and Ric Fleck. A 3.686 at 213.33 was enough to beat rising young star Ty Tutterow in the semifinals. He then used a starting-line advantage and 3.703-second pass to beat GALOT Motorsports driver John Strickland’s 3.723 in the final round. In his winning effort, Gonzales also performed several of the fastest runs in Pro Boost history over the course of the weekend. The Pro Line-powered Mustang was consistently in the 213 mph range throughout eliminations, though a best speed of 215.2 mph was set in the opening round. 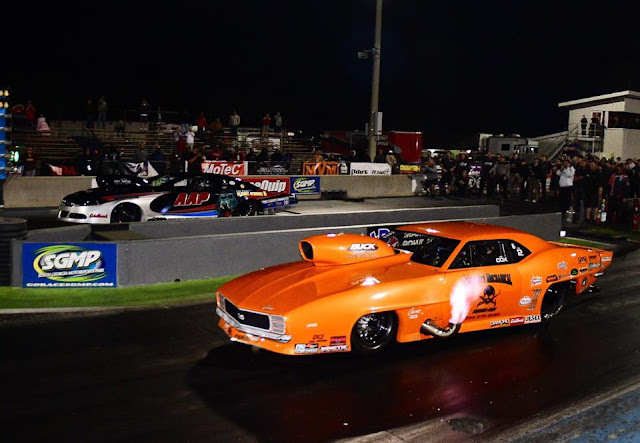 New York paving contractor John Montecalvo added another win to his illustrious mountain-motor Pro Stock career with his PDRA Southern Extreme Nationals win in Extreme Pro Stock. The number-two qualifier had his 2015 Camaro running consistently in the mid-4.0-second range, eventually defeating first-time Pro Stock finalist Scott Benham, who crossed the centerline. Defending Drag 965 Pro Extreme Motorcycle world champion Eric McKinney showed no signs of stopping his championship ways this weekend. The three-time PDRA champion defeated his teammate and tuner, Ashley Owens, in an all-McKinney Motorsports final round. 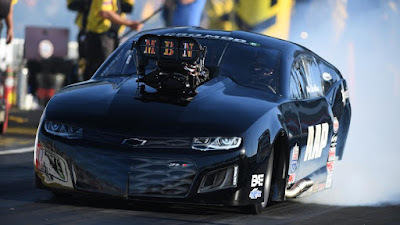 McKinney was the provisional low qualifier after Friday’s two qualifying sessions, though he was bumped to third in Saturday’s final session by Owens and Terry Schweigert. The Ohio rider’s Suzuki went progressively quicker in eliminations, beginning with a 4.07 at 176.7 mph over Monte Campbell and ending with a dominant 3.99 at 179.52 over Schweigert in the semifinals. Another sub-four-second pass nearly followed in the final, but McKinney’s 4.001 at 179.04 was quick enough to hold off low qualifier Owens and his 4.024 at 177.72. Fernandine, Florida’s Tom Vanbeek proved that an ultra-quick car isn’t always necessary to win in Magnafuel Top Sportsman as he upset low qualifier Randy Perkinson in the final. Vanbeek dialed in at 4.68 and 4.69 through eliminations, while Perkinson chose the low 3.9s for his dial-ins. Vanbeek marched around Top Sportsman hitters Aaron Glaser, Billy Albert, and Barry Daniluk before meeting Virginia’s Perkinson in the final. In the end, Vanbeek’s ’88 Beretta was quicker off the starting line and closer to his 4.68 dial-in with a 4.695 compared to Perkinson’s 3.926 on a 3.90 dial. 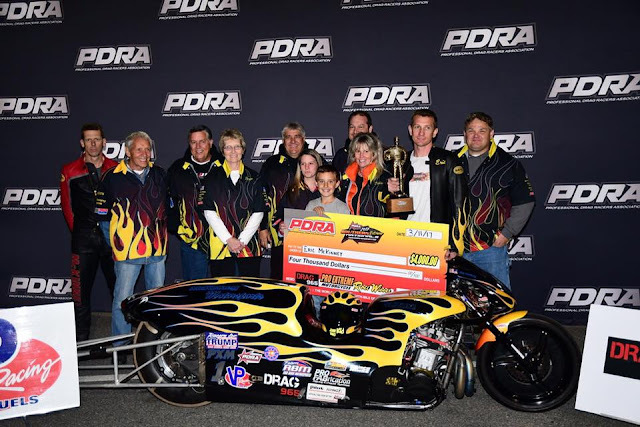 A mass of supercharged dragsters were on hand to compete in Lucas Oil Top Dragster, with Louisiana driver Mario Boesch earning the event win in his MKD Racing entry. He defeated low qualifier Jody Stroud, Matt Cooke, and Ashley Tidrick on his way to the final, where he faced defending world champion Justin Kirk. Boesch left the starting line last and was a few hundredths off his 3.91 dial-in, but Kirk slowed from his 3.87 dial-in to a 3.964, allowing Boesch to take the win. Campers Inn RV Pro Junior Dragster winner Sadie Wicks used a large holeshot to defeat Amber Franklin in the final round, running 7.964 on the 7.90 dial-in. The opposite was the case in the MegaCorp Top Junior Dragster final when Tripp McCarthy ran four thousandths off his 9.04 dial-in to overcome a starting-line advantage by Connor Shields, who broke out on his 9.38 dial with a 9.289. The next stop on the 2017 PDRA Tour is the 2017 PDRA East Coast Nationals, March 30-April 1, at GALOT Motorsports Park in Benson, NC. Brandon Snider in Qatar with the rest of the Al Anabi Performance!